Publisher’s Weekly offers up reviews of their top ten summer reads with topics ranging from a New York detective story to lost love in Ireland, mermaid visions and a re-telling of One Thousand and One Nights. Goodreads wins the “longest list” category (28,000+) of members’ popular summer read picks. 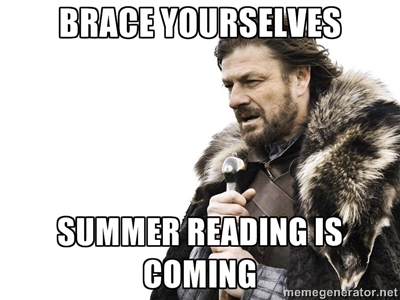 NPR has an entire section dedicated to summer reading as well as their top five teen reads. Fiction and non-fiction, old and new – Slate’s summer reading list for 2013 has it all. The LA Times recommends 165 different titles so there’s sure to be something there for every type of reader. Beaverton City Library has booklists just for teens & if you liked Percy Jackson or The Hunger Games, they’ve got recommendations for you. Speaking of libraries, our very own Multnomah County Library turns reading into a game for all to play & hey, prizes! All in all, this should be a great summer for reading. What books do you recommend to your fellow Cardinal? Let us know in the comments. Today’s the last day for the Writing Center so if you need some last minute writing help, come on in! I’ll be in the library until 4:30p today. 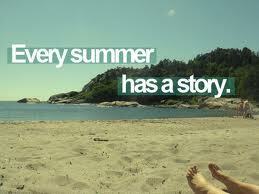 Summer is fast approaching! I’m sure you’re already swamped with college prep, IB Extended Essay writing, working, or just plain having fun, but please consider giving back to your community this summer. Not only will you be helping those in your community and adding vital experience to your resume and life, you’ll also feel great about giving back. Do you want to give your time back to your community and love the library? Do you have retail, library, book selling, or customer service experience? 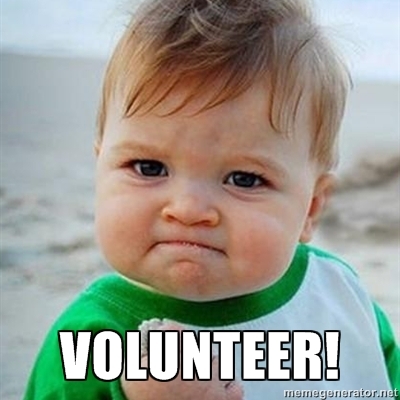 If so – The Friends of the Multnomah County Library may be the volunteer team for you. 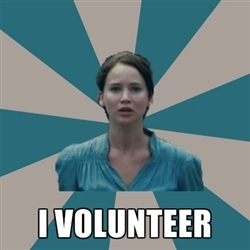 As a volunteer store clerk your primary duties are customer service, gift, and used book sales. All volunteers help to maintain the store through light housekeeping, merchandising and assisting with special projects as needed. We also expect you to promote memberships and special events organized by the Friends of the Library. We will provide you with the training and support that you need to be successful. We are recruiting for weekday and weekend shift times as available. We ask for a six month commitment and, because our volunteers are a vital part of our organization, a commitment to give two weeks notice when exiting FOL volunteer service. Do you remember when you knew a job, college or other career training was an option for you? Imagine being the person who introduces a child to more possibilities. That’s what a mentor can do. If you’re interested volunteering as a mentor, you can find a mentoring program in your community by going to http://oregonmentors.org/programs/search/ to search our database for a program that matches your interests and availability. There are hundreds of ways to mentor youth throughout the state, so find the place that’s right for you. Help your community, wildlife, and the environment! The Apprentice Ecologist Initiative (officially recognized by the U.S. EPA) has engaged tens of thousands of young people (kids, teens, and college-age youth) from around the world in environmental cleanup and conservation projects since 1999. Conduct your own local environmental stewardship project. After uploading your project photo and essay, we will publish your work on our Global Registry of Apprentice Ecologists and provide links to download an official Certificate of Achievement and an Apprentice Ecologist heat transfer (for T-shirt). An NWP tote bag (made with organic cotton) will be awarded to the authors of the 10 best essays on an annual basis. School groups, especially those working with at-risk and disadvantaged youth, are highly encouraged to participate. Three scholarships totaling $850 will be awarded annually to the authors of the top Apprentice Ecologist essays. Seeking volunteers for all aspects of our Organization. 3. Doing outreach Educational Reptile Presentations in the community. 4. Social media, website and blog monitoring and updates. Impact NW is looking for volunteers to coordinate and lead fun group activities for low income children at the Richmond Place housing site. Come in for one afternoon each week to engage with our families, encourage them to learn and have a blast in the process! Apply online at http://impactnw.org/main-navigation/how-to-help/volunteer/volunteer-how-to-apply/ or call 503-988-6887 x268. Gain classroom experience teaching elementary school children this summer! Impact NW is recruiting volunteer instructors to teach reading, writing, math, science, and many other subjects to students at Buckman SUN. Enjoy messy art and outdoor projects. We spend some time in hot summer weather with students. To apply, complete an online application here: http://impactnw.org/main-navigation/how-to-help/volunteer/volunteer-how-to-apply/. For more information visit http://impactnw.org/main-navigation/programs/youthfamily/community-schools/ or call 503-988-6887 x268.